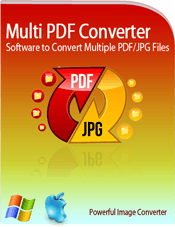 Multi PDF Converter is a desktop program that will quickly convert multiple PDF to JPG on your Mac or Windows in literally seconds. The software allows you to convert an unlimited number of PDF/JPG files of any size — securely on your desktop. No more tedious, manual file conversions - automate the process with this software. Select low, medium, or high output quality. Drag and drop your files into the application's window and click convert - that's it!